Disenchanted with modern Justice League comics, Lil’ Russell Burbage from Midway City has been creating his own JLA comic adventures! Russell typically writes and draws these stories, which feature characters from the Satellite Era JLA. 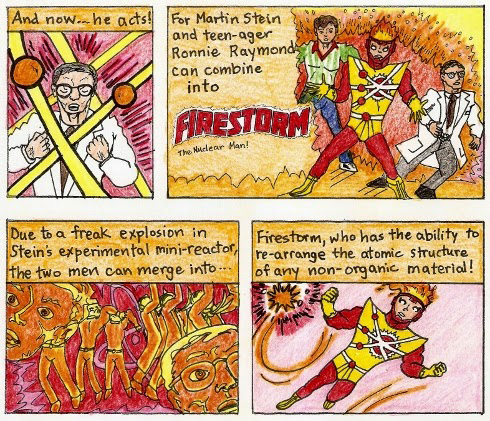 Set shortly after DC Comics’ JLA #100, Firestorm hasn’t appeared in any of Earth-Burbage stories… until now! The latest issue, Justice League #39, has been a year in the making and is an all-star event featuring artistic contributions from Andy Kapellusch, Aaron Bias, Corey Hodgdon, and Russell himself. So exciting that all of these folks have been tremendous supporters of the FIRE & WATER PODCAST! One story within Justice League #39 features Typhoon vs Aquaman & Red Tornado! Great match-up with wind and water on each side! Another story within the issue is a seven-page adaption of of DC Comics Presents #17 featuring Superman & Firestorm vs Killer Frost! So much fun! I love that these comics were spawned by Russell’s disappointment in modern comics. Such a positive and creative way to respond! Be sure to head over to Russell’s website to read the entire comic, which includes other adventures with Martian Manhunter, John Stewart, Wonder Woman, Hawkman & Hawkwoman, Batgirl, Elongated Man, and even The Warlord! 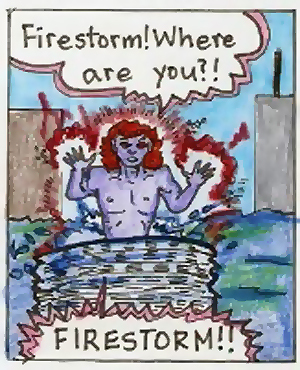 Support Firestorm (and Lil’ Russell Burbage)! Fan the flame!